On the morning of February 15th, 1989, after a war of unexpected length and surprising brutality, the last soldier of the Soviet Red Army, its commanding general Boris Gromov, crossed the bridge at Termez out of Afghanistan and back home to the U.S.S.R., thus ending the ruinous conflict. When Soviet troops first crossed the treacherous frontier a decade before they hardly could have predicted—nor could have anyone in the world for that matter—the difficulty they would face in pacifying a seemingly backward and primitive people and that they would ultimately fail. But perhaps they should have suspected the problems they would encounter. The 1979 invasion was hardly the world’s largest country’s first Afghan adventure. Throughout much of the 19th century, Russia and Great Britain sparred in the region and produced a number of dustups and intrigues, during a period commonly known as The Great Game. While Russia did gain some territory from these episodes, they managed to escape the era without any major blights on their military record, unlike the British who suffered major reversals in two Anglo-Afghan wars. Perhaps, though they saw the failures of the British excursions, having not experienced them firsthand lead them to a false confidence. Or perhaps by the late 20th century they became empowered by their vast technological advantage and in that put their ultimate trust to give them victory. It would not have been the first time a superpower made that mistake. But all of this begs the question, why invade in the first place, regardless of the supposed advantages? What was there to gain from the conquest of essentially a primitive central Asian backwater? The answer can be found, like many answers when discussing the Cold War era, in the preservation and expansion of an ideology. In an attempt to further proselytize the world masses to the doctrine of Communism and compete in the world influence market with the United States and the West by propping up a failing communist regime, the Soviet Union launched a war that would become one of the leading factors in its ultimate demise. Afghanistan had, for most of its existence as a nation, been in constant turmoil. However, for a forty year period, beginning in 1933, a period of relative stability was achieved under the reign of King Zahir Shah. Twenty years into these peaceful days, a relationship with the Soviet government was forged. The Afghan Prime Minister, Mohammoud Daoud, intended to bring his country’s army into the twentieth century. 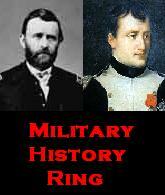 To that end he requested military aid from the United States. However, the “U.S. rejected [his] request and Daoud turned to the Soviet Union for military aid” (The Origins of the Soviet-Afghan War). Hereafter, the Soviet Union would continue attempts to expand its influence over Afghanistan. Daoud was deposed in 1963 but, according to Robert Morris, was later able to “overthrow the venal monarchy of King Zahir Shah” (A19) and declare Afghanistan a republic. Though he accepted Soviet military aid to modernize the Afghan army and many of the officers he relied on during the coup had been trained in the Soviet Union, Daoud also began making overtures to other Muslim nations on trade, including those with close ties to the United States like Iran and Saudi Arabia, and through a number of purges, began eliminate more leftist members of the government. A country study published by the U.S. government has stated that while “loosening of ties with the Soviet Union was gradual” his move toward “the right and realignment made the Soviets anxious.” It also made their Afghan clients upset. In April 1978 troops loyal to Afghan communists—as well as non-communist elements that disliked Daoud—staged a coup. Morris has reported that “a leftist commander launched his jet fighters [from Bagram airport] with withering effect on Daoud’s presidential palace” (A19). Daoud was killed in his own palace and a new government under Nur Muhammad Taraki of the Marxist People’s Democratic Party of Afghanistan (PDPA) was established. The coup did little to increase stability in the country. Within the PDPA there were divisions, not to mention the obvious conflict between a government with an atheistic communist ideology and a fervently Muslim population. Within the fractioned PDPA the Soviets had favored the continued rule of Taraki, however his deputy Prime Minister and rival Hafizullah Amin conspired against him, had him murdered, and seized power in September of 1979. Upon doing so, Amin tried, as the U.S. country study states, “to moderate what many Afghans viewed as an anti-Islam regime.” His efforts however were in vain and the echoes of rebellion were in the air. Even before Taraki’s death, “the Afghan government repeatedly requested the introduction of Soviet forces in Afghanistan” (“Soviet war in Afghanistan”). In December of that year Soviet troops stormed the frontier and parachuted into Kabul. According to the official version of history, CIA aid to the Mujahadeen began during 1980, that is to say, after the Soviet army invaded Afghanistan, 24 Dec 1979. But the reality, secretly guarded until now, is completely otherwise: Indeed, it was July 3, 1979 that President Carter signed the first directive for secret aid to the opponents of the pro-Soviet regime in Kabul. And that very day, I wrote a note to the president in which I explained to him that in my opinion this aid was going to induce a Soviet military intervention (76). Also, it has been noted by Steven Coll that Amin had met with U.S. diplomat J. Bruce Amstutz at least five times in 1979 and while the “discussions were stilted and unproductive” (48) they still aroused concern with the Soviets. It has also been seen in declassified top secret Soviet documents that the Politburo was concerned about American intervention in the country. In a top secret report by Soviet ministers from December 1979 it was worried that “efforts were made to mend relations with America as a part of the ‘more balanced foreign policy strategy’ adopted by H. Amin” (160). In its attempt to avoid the loss of a pliable client state, even one with little strategic significance, apparently for no other reason than to keep it from becoming too friendly with its rival ideologically, the U.S.S.R. made a critical blunder. They underestimated the resolve of not only Afghanistan’s inhabitants but also the resolve of those willing to keep it from falling under Soviet control. 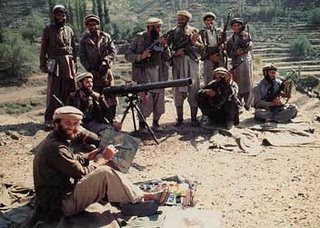 Over the course of the war, the Afghan mujahadeen would receive support from the United States as well as Pakistan, Saudi Arabia, Iran, and even the communist Chinese. Ironically, the fight to preserve an ideology in that seemingly inconsequential country eventually lead to that ideology’s collapse in the country where it had originally germinated and bloomed over seventy years before. Blood, Peter, ed. Daoud’s Republic, July 1973-April 1978 & Communism, Rebellion, and Soviet Intervention. Afghanistan: A Country Study. Washington: Government Printing Office for the Library of Congress. 2001. http://countrystudies.us/afghanistan/28.htm & http://countrystudies.us/afghanistan/29.htm. Coll, Steven. Ghost Wars: The Secret History of the CIA, Afghanistan, and bin Laden, from the Soviet Invasion to September 10, 2001. New York: Penguin Books, 2004. “Documents on the Soviet Invasion of Afghanistan.” Cold War International History Project. Woodrow Wilson International Center for Scholars. Nov. 2001: 160. http://www.wilsoncenter.org/topics/pubs/e-dossier_4.pdf. Morris, Roger. “Afghanistan: another ill-fated attempt?” The Globe and Mail 1 March 2007: A19. “Soviet war in Afghanistan.” Wikipedia. 6 Jan. 2008 http://en.wikipedia.org/wiki/Soviet_war_in_Afghanistan. “The origins of the soviet-afghan war.” Alternative Insight. 1 Nov. 2001. http://www.alternativeinsight.com/Afghan_War.html. This is the abstract for a paper I wrote for my Research, Writing, and Analysis class. Consider it the teaser trailer for the feature presentation (full paper) that will be posted later this week. 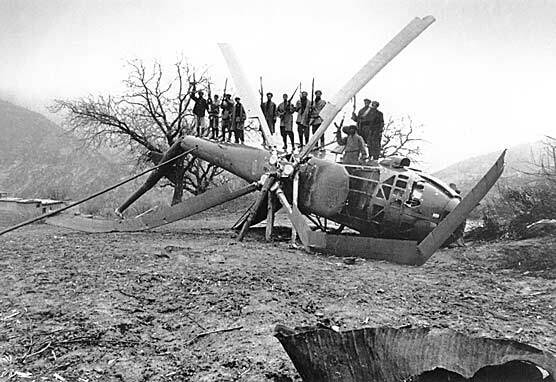 Just before Christmas in 1979, Soviet troops from the Red Army began to crash across the border with Afghanistan. Ten years later, they would limp back home, badly, and even fatally, wounded. The decade long war, a war in which they would hold every technological advantage, was no doubt unpredictably brutal and long to its planners. But should they have known better? This was their neighborhood they were playing in, not some distant, unfamiliar land. They had been front row witnesses, and occasionally participants, in the adventures and follies of empires in Afghanistan for decades. What caused them to repeat the mistakes of the past? Was it arrogance and reliance on their modern technological arsenal? Or was it what Louis Dupree once told William Maley, author of The Afghanistan Wars, that once Afghanistan is in your blood, you can never get rid of it? Did they just have the bug? Through my research, I intend to show that The Soviet Union’s ill-fated adventure into this strange and treacherous land was a result of, as was so much else during the Cold War, a quest to expand an ideology to other lands, whether by friendly, coercive, or brutal methods.